These telescoping tube clamps feature an adjustable screw to get the perfect fit for the sliding tube and a clamping lever that allows for quick adjustment of pole length. One-piece construction makes for easy assembly of poles. Simply bond carbon fiber tube into lower half of the tube clamp and slide next smaller tube into top half of clamp. Optional tube stops can be purchased to prevent tubes from coming apart when fully extended. For complete assembly instructions, see link to PDF below. 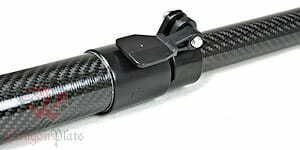 For best fit, use the carbon fiber tubes listed below for these clamps.